Former vice president of the Democratic Republic of Congo Azarias Ruberwa is calling on the government to halt plans to lift the immunity of opposition leader Jean-Pierre Bemba in order to charge him with high treason. Kari Barber reports from VOA's West and Central Africa bureau in Dakar. Former Congolese vice president and rebel leader Azarias Ruberwa says opposition leader Jean-Pierre Bemba, who is in Portugal for medical care, should not face trial upon returning to the country for his role in a two-day battle that left hundreds dead. Ruberwa says the nation's democracy is fragile and the situation would be better resolved through political discussion than through the court. Last month, fighting erupted in the capital between the army of President Joseph Kabila and Bemba's private militia after he refused to disband his forces. As a senator, Bemba technically has immunity from charges, but the attorney-general has said he will seek to have that lifted. Ruberwa, who was one of four vice presidents during the nation's transitional government, says this is a step in the wrong direction. Ruberwa says it is the role and responsibility of the government and ruling party to help resuscitate the opposition. Members of Bemba's opposition party have suspended their participation in parliament because they say they do not feel safe. 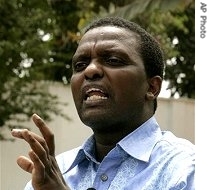 London-based Congolese analyst Muzong Kodi says their boycott could be effective. "Given that Mr. Kabila's coalition has the majority, they can still go on holding meetings, but there is going to be a problem of credibility and political legitimacy that is going to come from the boycott," said Kodi. Kodi says it is in the best interest of Mr. Kabila's party to retain a semblance of opposition to quiet critics inside and outside the country. As for Ruberwa and other politicians who have spoken against judicial action, including members of Mr. Kabila's party, Kodi says their efforts may not be enough. "They will need pressure to be brought to bear on the ruling coalition by the development partners of the DRC," said Kodi. Bemba ran against Mr. Kabila in presidential elections last year that many hoped would guide the country toward democracy after years of war and instability. 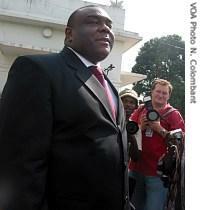 Many were killed in clashes between Bemba and Mr. Kabila's militias before and after the election.